1 A None No Power Seat 1 A is a standard Business bulkhead seat. 1 B None No Power Seat 1 B is a standard Business bulkhead seat. 1 D None No Power Seat 1 D is a standard Business bulkhead seat, although proximity to the lavatory may be bothersome. 1 F None No Power Seat 1 F is a standard Business bulkhead seat, although proximity to the lavatory may be bothersome. 1 G None No Power Seat 1 G is a standard Business bulkhead seat, although proximity to the lavatory may be bothersome. 10 A None No Power Seat 10 A has a misaligned window. 10 B None No Power Seat 10 B is a standard Business Class seat. 10 G None No Power Seat 10 G has a misaligned window. 11 A None No Power Seat 11 A is a standard Business Class seat, although noise from the more crowded Economy Class may be bothersome. 11 B None No Power Seat 11 B is a standard Business Class seat, although noise from the more crowded Economy Class may be bothersome. 11 D None No Power Seat 11 D is a standard Business Class seat, although noise from the more crowded Economy Class may be bothersome. 11 F None No Power Seat 11 F is a standard Business Class seat, although noise from the more crowded Economy Class may be bothersome. 11 G None No Power Seat 11 G is a standard Business Class seat, although noise from the more crowded Economy Class may be bothersome. 15 A None No Power Seat 15 A may have restricted legroom due to the position of the bulkhead. The tray table is in the armrest, making the armrest immovable and slightly reducing seat width. There is no floor storage for this seat during take-off and landing. 15 B None No Power Seat 15 B may have restricted legroom due to the position of the bulkhead. The tray table is in the armrest, making the armrest immovable and slightly reducing seat width. There is no floor storage for this seat during take-off and landing. 15 C None No Power Seat 15 C has extra legroom due to the position of the bulkhead. The tray table is in the armrest, making the armrest immovable and slightly reducing seat width. There is no floor storage for this seat during take-off and landing. 15 D None No Power Seat 15 D has extra legroom due to the position of the bulkhead. The tray table is in the armrest, making the armrest immovable and slightly reducing seat width. There is no floor storage for this seat during take-off and landing. 15 E None No Power Seat 15 E has extra legroom due to the position of the bulkhead. The tray table is in the armrest, making the armrest immovable and slightly reducing seat width. There is no floor storage for this seat during take-off and landing. 15 F None No Power Seat 15 F may have restricted legroom due to the position of the bulkhead. The tray table is in the armrest, making the armrest immovable and slightly reducing seat width. There is no floor storage for this seat during take-off and landing. 15 G None No Power Seat 15 G may have restricted legroom due to the position of the bulkhead. The tray table is in the armrest, making the armrest immovable and slightly reducing seat width. There is no floor storage for this seat during take-off and landing. 16 A None No Power Seat 16 A has a misaligned window. 16 G None No Power Seat 16 G has a misaligned window. 18 F None No Power Seat 18 F has restricted legroom due to an entertainment box underneath the seat in front. 19 C None No Power Seat 19 C is an Economy Class seat where the close proximity to the lavatory and galley may be bothersome. 19 D None No Power Seat 19 D is an Economy Class seat where the close proximity to the lavatory and galley may be bothersome. 19 E None No Power Seat 19 E is an Economy Class seat where the close proximity to the lavatory and galley may be bothersome. 19 F None No Power Seat 19 F is an Economy Class seat where the close proximity to the lavatory and galley may be bothersome. 19 G None No Power Seat 19 G is an Economy Class seat where the close proximity to the lavatory and galley may be bothersome. 22 A None No Power Seat 22 A is an Economy Class seat, however, proximity to the lavatory and galley may be bothersome as passengers tend to congregate in this area. The tray table is in the armrest, making the armrest immovable and slightly reducing seat width. There is no floor storage for this seat during take-off and landing. 22 B None No Power Seat 22 B has extra legroom due to the exit row. Proximity to the lavatory and galley may be bothersome as passengers tend to congregate in this area. The tray table is in the armrest, making the armrest immovable and slightly reducing seat width. There is no floor storage for this seat during take-off and landing. 22 F None No Power Seat 22 F has extra legroom due to the exit row. Proximity to the lavatory and galley may be bothersome as passengers tend to congregate in this area. The tray table is in the armrest, making the armrest immovable and slightly reducing seat width. There is no floor storage for this seat during take-off and landing. 22 G None No Power Seat 22 G is an Economy Class seat, however, proximity to the lavatory and galley may be bothersome as passengers tend to congregate in this area. The tray table is in the armrest, making the armrest immovable and slightly reducing seat width. There is no floor storage for this seat during take-off and landing. 23 B None No Power Seat 23 B is a standard Economy seat, although proximity to the galley may be bothersome. 23 F None No Power Seat 23 F is a standard Economy seat, although proximity to the galley may be bothersome. 24 C None No Power Seat 24 C has restricted legroom due to the bulkhead wall. The proximity of the galley may be bothersome. The tray table is in the armrest, making the armrest immovable and slightly reducing seat width. There is no floor storage during takeoff and landing. 24 D None No Power Seat 24 D has restricted legroom due to the bulkhead wall. The proximity of the galley may be bothersome. The tray table is in the armrest, making the armrest immovable and slightly reducing seat width. There is no floor storage during takeoff and landing. 24 E None No Power Seat 24 E has restricted legroom due to the bulkhead wall. The proximity of the galley may be bothersome. The tray table is in the armrest, making the armrest immovable and slightly reducing seat width. There is no floor storage during takeoff and landing. 28 F None No Power Seat 28 F has restricted legroom due to an entertainment box underneath the seat in front. 3 G None No Power Seat 3 G has restricted legroom due to an entertainment box underneath the seat in front. 43 B None No Power Seat 43 B is an Economy Class seat however, the close proximity to the lavatory and galley may be bothersome. 43 C None No Power Seat 43 C is an Economy Class seat however, the close proximity to the lavatory and galley may be bothersome. 43 E None No Power Seat 43 E is an Economy Class seat however, the close proximity to the lavatory and galley may be bothersome. 43 F None No Power Seat 43 F is an Economy Class seat however, the close proximity to the lavatory and galley may be bothersome. 43 G None No Power Seat 43 G is an Economy Class seat however, the close proximity to the lavatory and galley may be bothersome. 45 A None No Power Seat 45 A is an Economy Class seat however, the close proximity to the lavatory and galley may be bothersome. 45 B None No Power Seat 45 B is an Economy Class seat however, the close proximity to the lavatory and galley may be bothersome. 45 C None No Power Seat 45 C is an Economy Class seat however, the close proximity to the lavatory and galley may be bothersome. 45 D None No Power Seat 45 D is an Economy Class seat however, the close proximity to the lavatory and galley may be bothersome. 45 E None No Power Seat 45 E is an Economy Class seat however, the close proximity to the lavatory and galley may be bothersome. 8 B None No Power Seat 8 B is a standard Business Class seat. There are universal power ports in Business class. ANA currently has two configurations of its B767-300ER aircraft. This is the older configuration offering both Business and Economy class seats. 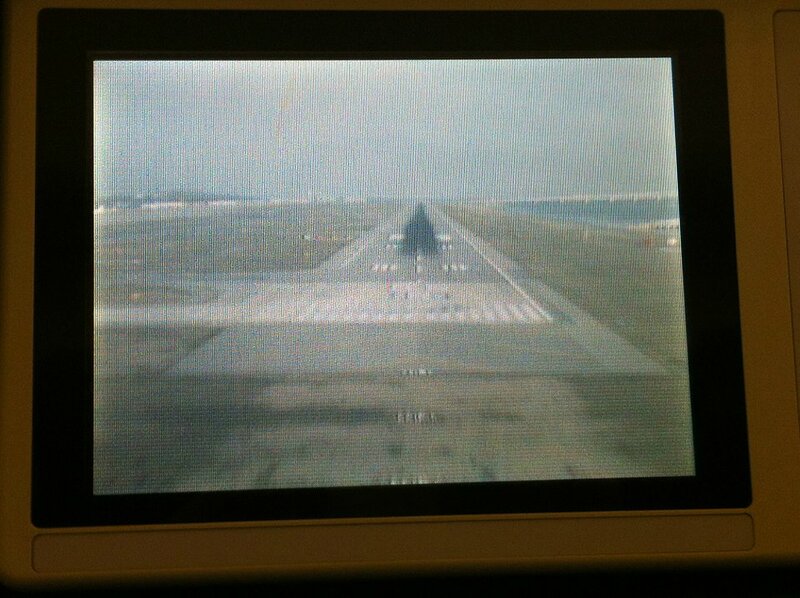 I took this plane in Economy class on the CAN-HND route. 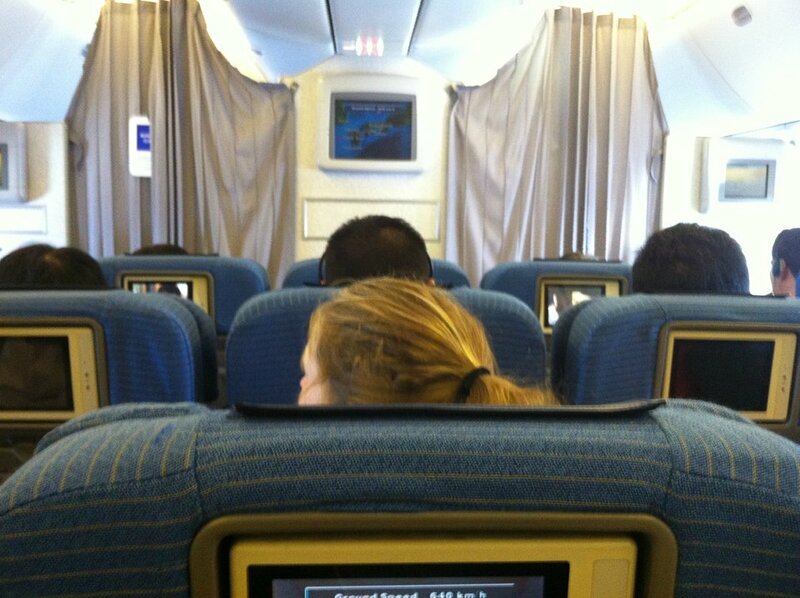 The flight was pleasant and the service was excellent, but the interior is seriously out of date, even for Economy. No in-flight Wifi, no USB chargers, small video displays, limited movie selections, no touchscreen controls, and old-school wired remotes placed awkwardly in the armrest. If these kinds of things are important to you, you may want to consider taking a different plane. 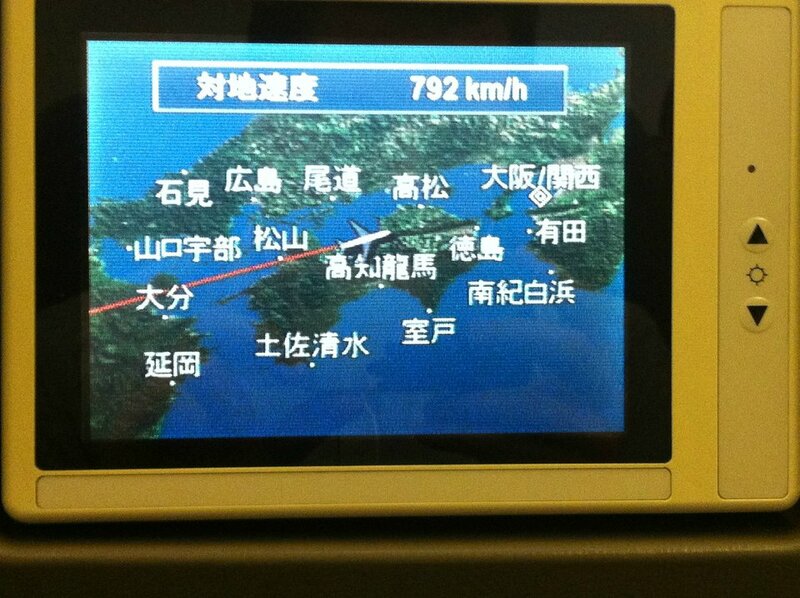 Flew this aircraft on the Tokyo Narita to Hong Kong route. Like other comments before, the seats are very cramped. Very little legroom and the three-inch wide armrests make the seats very narrow. It was very hard to sleep despite coming from an 11 hour flight from the U.S. The interior is very outdated; a complete downgrade from the 787 I had just come from. The TV's are small and have grainy displays. 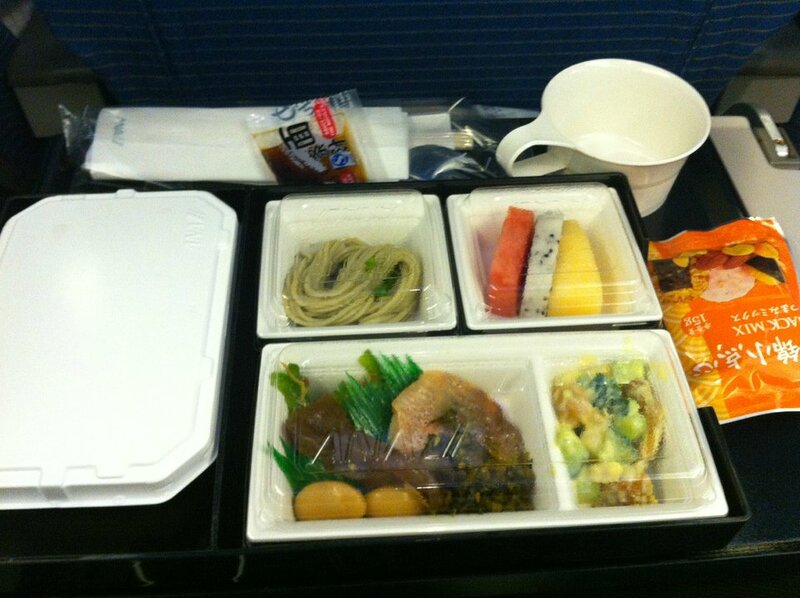 It was nice that ANA served food on a four hour flight and the flight attendants were top-notch. Overall, a disappointing experience for a five-star airline. There's a seat post and an entertainment box that consumes 60% of the foot box. Pick the aisle in the middle. 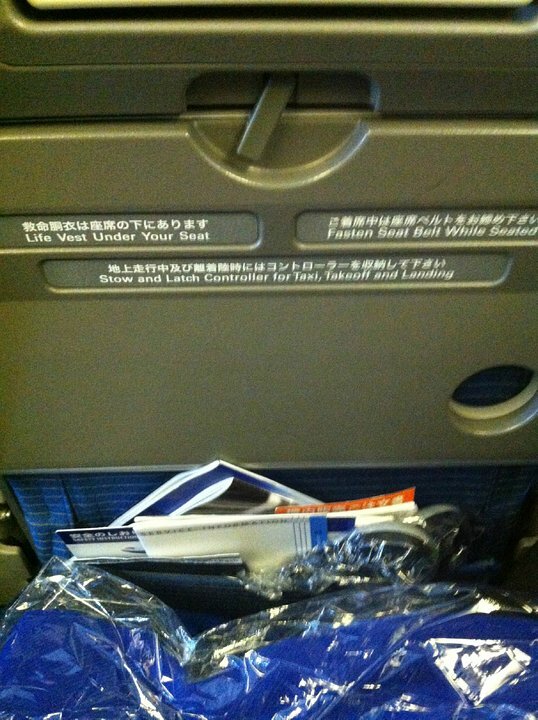 I hope ANA is going to change these Business Class seats soon. They are not competitive. The are not lie-flat, and for a 9 hour flight, that's just not acceptable any more. Good leg room and width. Not a problem being next to the lavatory. I like how ANA hand out toys for the kids, keeps them quiet. Nice airline! I fly biz on this a/c all the time. Row 11 is terrible. Almost every flight there is a baby in the first econ row on the bulkhead. Very annoying. Airlines should position babies 5 rows from biz. An old aircraft with very tight seating; not a pleasant experience for my wife and I and our 2 small children.